FarmVet would like to congratulate Joe Fargis, one of our Sponsored Riders, for the honor he received in December from the United States Hunter Jumper Association. 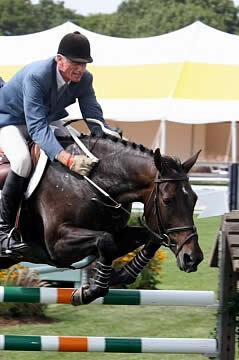 Last month Fargis and fellow equestrian, Larry Langer, were awarded with the USHJA Lifetime Achievement Award at the 2009 Evening of Equestrians Dinner during. Recipients of this award have dedicated their lives to promoting the disciplines of hunters and jumpers on a national level. Olympian Joe Fargis certainly has an impressive list of accomplishments. He has represented the United States for more than 40 years and continues to be a force to reckon with today. Fargis is probably best known for his double Gold Medal wins at the 1984 Los Angeles Olympic Games with Touch of Class. Then in 1988 at the Olympic Games in Seoul, Korea, Fargis and his mount, Mill Pearl, helped the U.S. team win the Silver Medal. Today Fargis continues to compete in Grand Prix events around the country and has recent wins at such events as the American Gold Cup in Devon, the USET Wellington Cup, the Hampton Classic Grand Prix, and the I Love New York Grand Prix. Fargis also gives back to the equestrian community by serving on the USHJA Horse Welfare Committee and by teaching clinics all over the country.